Château Vartely is a fairly young winery that has managed in a short period of time to become a company emblematic of its country. From the winemaker’s perspective, Château Vartely is a winery that combines the latest innovations in grapes cultivation and processing technology with its passion for producing wines of top quality. The excellence and prominent quality of Château Vartely wines has been recognized through medals and honors awarded at the most prestigious international competitions such as: Mondial de Bruxelles, Mundus Vini, Vinalies Internationales, Decanter, International Wine & Spirits Competition, Sakura, Citta del Vino, International Wine Challenge, and many others. The name Vartely originates from the name of the town Orhei that in Hungarian means “place of the fortress”, (vár + hely or fortress + place). The brand Château Vartely was developed and launched in 2004. Its slogan says “Wine with love to you”, because every noble wine produced at Château Vartely has a part of the heart and dedication of those working here. At Château Vartely not only do we produce wine, we also cultivate love for this noble beverage. We value our partners and customer that through their dedication and appreciation contribute to the overall success of Château Vartely wines in Moldova and worldwide. With professional expertise and passion in every aspect of winemaking, our Château Vartely team is here for you day in and day out. Grapes carefully grown in our own vineyards, located in areas of IGP Codru and IGP Valul lui Traian, ensure that all wines are crafted to the highest level of quality. The distinctive terroir of these regions confers wines the unique character and personality, vintage to vintage. Wines of Château Vartely, produced from the European and indigenous grape varieties, have placed the company in the top of the consumer preferences. In 2008, in respect for the traditions and local authenticity, Château Vartely opened a tourist complex that through its distinct architecture and charm has become a true picturesque retreat. 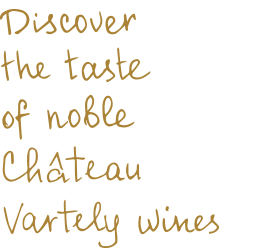 Château Vartely officially appeared at the market as early as in 1996 and established itself as a leader on the stage of national wine. In 2004 there had been floated the Château Vartely Company, which had already gained an international distinction; and in 2008 there had appeared a Touristic Complex, equipped with all the necessities for our guests. All that space is situated only 50 kilometers from Chisinau city. The total area of Château Vartely vineland is 300 hectares, situated in the zone of Codru and Bugeac; and the vintage grown within this area is being bottled annually in more than 4,5 million of bottles. The Château Vartely tourist complex operates three gorgeous villas, capable to accommodate up to 40 guests. The winery houses 2 dedicated tasting rooms. Every year tens of thousands of tourists from around the world visit Château Vartely winery and tourist complex. In 2015, more than 15000 tourists enjoyed their visit to Château Vartely. The total vineyard area covers about 300 hectares. The Château Vartely winery is a committed leader in promotion of the indigenous (local) grape varieties such as Royal Maiden (Feteasca Regala), Black Maiden (Feteasca Neagra) and Rare Black (Rara Neagra) both at the national and international level. The oldest bottle in the winery’s collection is a 2005 Merlot. The winery’s annual production is about 4.5 mln bottles of wine.